BREXIT is more risky, but is it the land of opportunity? Beware loss aversion! All change is risky because we are moving into territory we are less familiar with, so we are not as well informed as to what could happen as when we stay where we are. The REMAIN campaign appears to be largely based on the understandable fear of what might go badly in a new territory – that of being outside Europe. Risk psychologists like Daniel Kahneman, in his Nobel prize winning work, call this “loss aversion”. Change brings more risk because it brings a greater variability of possible outcomes, but those outcomes can be better than expected as well as worse. The problem is that our evaluation of these two possibilities is not symmetrical. We tend to be more concerned about possible loss than we are excited about possible gain. In my book, “Risky Strategy”, now available on Amazon on pre-order to be published in August (http://amzn.to/1Q3L2Gn), I talk about this phenomenon and illustrate it with the diagram below, which is a representation of the risk-return trade-off which most financial analysts and investors are familiar with. 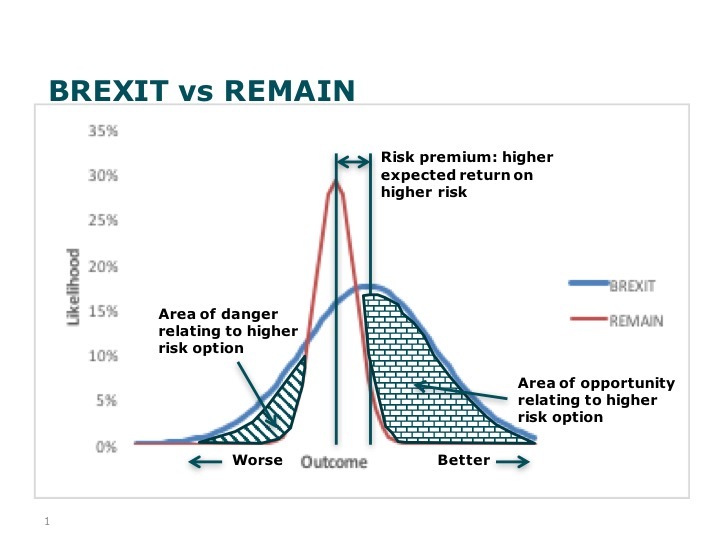 The idea is that risk is actually about greater variability of possible future outcomes. And with greater risk, we generally expect to achieve a better outcome than with less risk. So when we look at what statisticians call the “normal” curve (or bell curve) below, mapping possible quantified future outcomes (x axis) against the likelihood of them occurring (y axis), the more risky option is represented by the flatter bell, and the less risky, the taller narrower bell. What the diagram illustrates is that the peak of the flatter more risky bell represents a better expected outcome than that of the taller less risky bell. So if we plug into this our European referendum options, I argue that BREXIT is represented by the flatter curve, and REMAIN by the taller curve. The shaded area to the left represents the possible outcomes that could be worse in a BREXIT situation. The shaded area to the right represents what could be better in a BREXIT situation. Human nature apparently tends to focus more, and therefore be more concerned about, the loss area. This is our loss aversion. But the area of opportunity is significantly bigger! So what area of opportunity would BREXIT offer? I would like to suggest that we would be able to do more of what we believe is right, and not be constrained in this by Brussels. I would like to suggest that we would not lose anything that is currently working well to mutual benefit – why would we? Why would we see reduction in any trade with Europe that is beneficial to both buyer and seller? We remain committed to free and fair trade, why should that change? All that might change are those things which are not mutually beneficial. For example, we would allow workers from Eastern Europe who brought value to the UK economy, as many do now. But we might discontinue acceptance of those who come to diminish our society in some way. 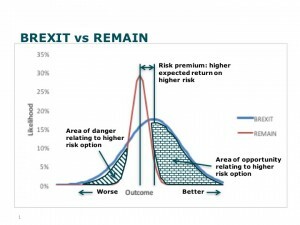 If we can overcome our loss aversion, then the risky BREXIT option could bring us more upside than downside – it could be the land of opportunity!